Having to stand is bad - Standing takes more energy and, thus, provides an incentive to not vote on all the candidates, judges, and amendments. The height of the electronic voting machine does not adjust - I am 5'10" and had to stand for 15 minutes with my head down and neck bent in order to carefully read the state amendments. People taller than me would certainly have more issues with the height of the electronic voting machine. Which brings up a another point, I recommend pre-reading your state's amendments to expedite the process. Only two electronic voting machines - There were 30-50 paper voting booths but only two electronic voting machines and, thus, people had to wait in line if they wanted to vote electronically. In this day and age, it seems like electronic voting would be the preferred mechanism with limited paper voting provided for people not comfortable with computers. Touchscreen was easy to use - Colorado's touchscreen system was easy to use and navigate. Prevents mistakes - The computer does not let you incorrectly cast a vote for two candidates running for the same office (i.e., vote for both McCain and Obama). In addition, correcting a mistake is as simple as hitting the back button or clicking on a vote mark to un-mark it. Computers should result in less mistakes - I would like to believe that using a computer to vote increases the accuracy with which my votes are recorded and tallied. 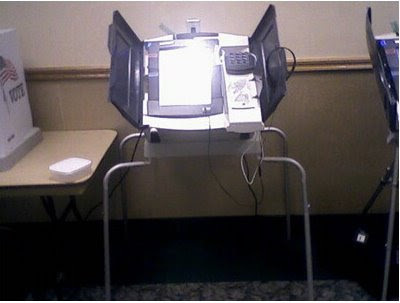 The following picture was taken with my cell phone's low quality camera and shows the electronic voting machine that I used to vote. What is your preferred method of voting: paper or electronic? The real problem we faced using is awareness about how to use.